How to Fix iPhone 7/7P Fingerprint Not Working? 2. Go to settings – Touch ID & passcode – enter your passcode, the fingerprint is grayed out. 4. After scraping，apply some tin on it, and then connect the new iPhone fingerprint flex cable. 5. After finish the connection, first we need to test it with a Uni-T UT81B digital multimeter, if the test is successful, we can reinforce it. 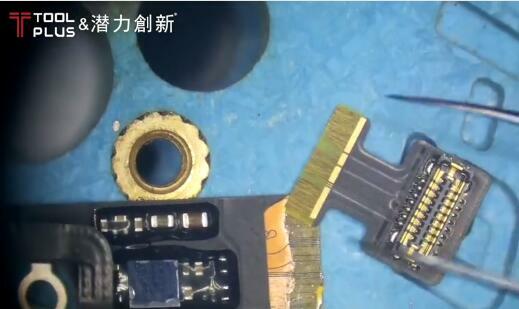 Cut off a small piece of discarded fingerprint flex cable, use glue to cover the docking area for protection. After the glue has solidified, install it onto the iPhone then test it again. The iphone 7 broken touch ID Hardware Fixed finished. After the iPhone 7 generation, the fingerprint is not the same as the previous fingerprint. Before the 7th generation, you can change the home button. There is no fingerprint at all. The return and wake-up functions are still there. After the 7th generation, once the fingerprint of the original machine is damaged, it is replaced by another one. Fingerprint function, and even the return function of the Home button is not available.